Arkansas State Collectible Set. Peach Seed Jigged Dark Red Bone Trapper (6254 SS) features the Case Arrowhead shield. "Long Tail C" serialization, and is embellished with the State nickname and shape on the Tru-Sharp® Surgical Steel blades. 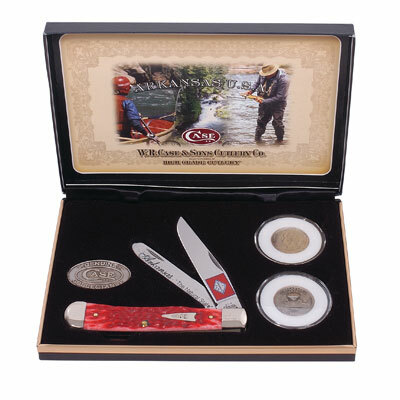 Each knife is packaged in this handsome jewelry styled box with gold trim and Arkansas artwork and is displayed with the uncirculated US Philadelphia (P), and Denver (D) Mint State Quarters and Genuine Case Collectable Medallion. As with all natural material color and texture may vary. Made in the USA.